Sometimes you want a grilled cheese. 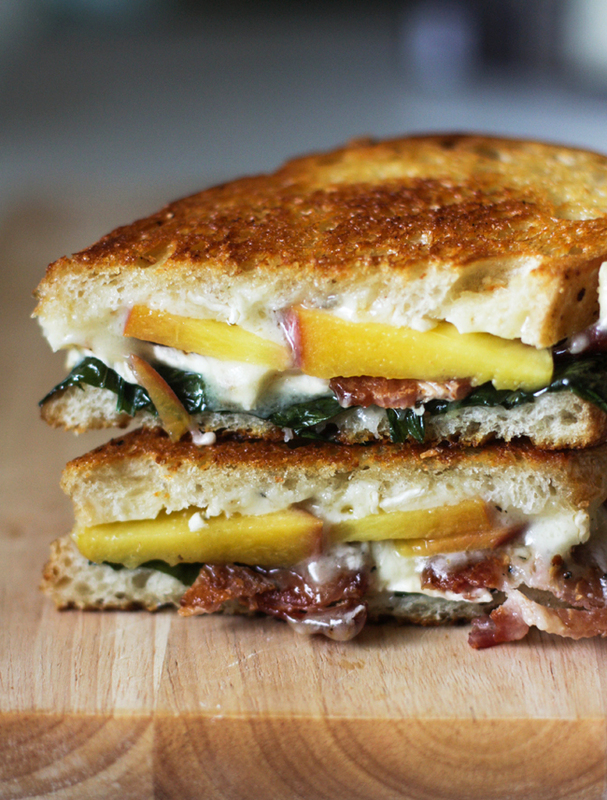 And sometimes, you want a grilled cheese that changes your day. This is that grilled cheese. Sweet, salty, crunchy, melty and a little earthy. Oh so delicious. I made one for Tommy a few days ago, and he said it may be the best thing he has ever eaten. Mission accomplished. Making a grilled cheese certainly isn't rocket science, but there are a few things that need to happen for the best results. First, we need cheese in between every ingredient. It's our glue, and we want our grilled cheese to be one solid sandwich. Next, we need to be patient. Don't crank up the heat right away! Let the inside get all melty and delicious, then turn up the heat a bit to develop a nice crispy outside. Once it's done, let it sit for a few minutes to cool; we don't want all our ingredients to run out! 1. 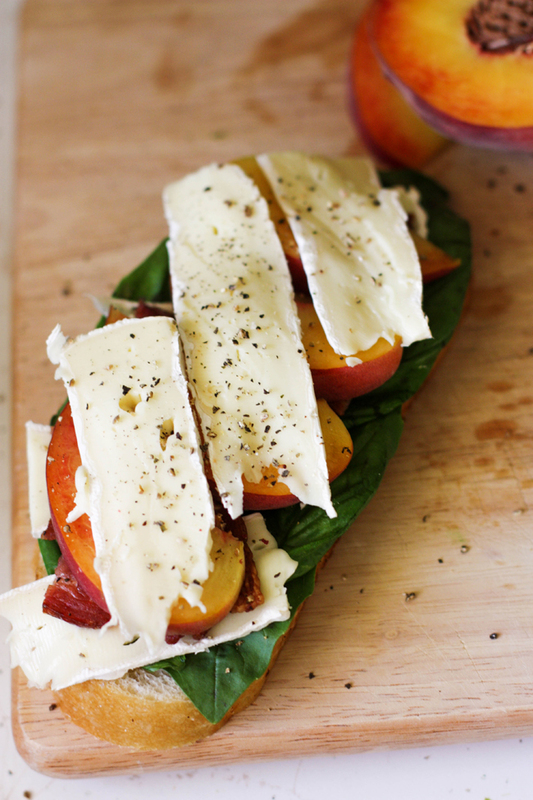 On a piece of sliced bread, place basil followed by a couple slices of brie. 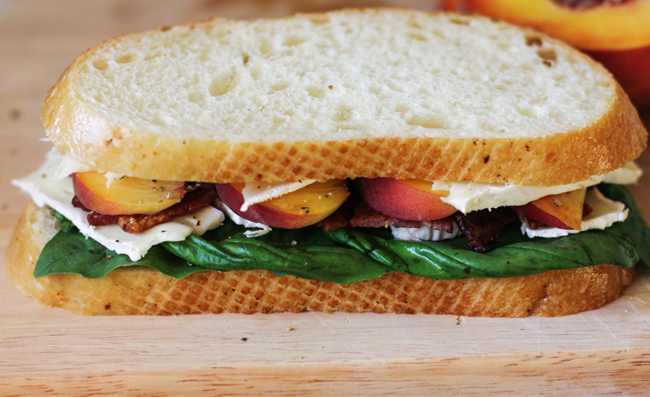 Follow this with bacon pieces, more brie, peach slices, then more brie. Sprinkle with fresh pepper. Top with another piece of bread, then butter both sides of the bread. 2. Heat pan to medium-low heat, and let the inside of the sandwich get melty. Once the inside is melted, turn up heat to get both sides of bread golden brown (if they aren't already). 3. Let sit for a few minutes, and then dig in! This looks AMAZING!! I think this is what I'll be making this weekend. Holy moly so good. Thanks for the tips on the art of grilled cheese. Brie is delish.